Tools and techniques to help you capture detailed information on every customer who walks into your store, but doesn’t buy today. How many people call your store every month? How many come in the store… but don’t buy. How many visitors do you get on your website? Think back on the type of advertising you’ve done in the past. Do you use radio or TV trying to broadcast your message to everyone in the county, even though most of those listeners are not part of your target market? Do you send out tens of thousands of newspaper ads and circulars hoping that some small percentage of the readers will come in? If you are like most retailers, you’ve done some or all of the above. I’m not saying to stop using those media, but I am saying there is definitely a better, more efficient way to advertise. To use this strategy you need to identify who your customer really is. This is an exercise that everyone can benefit from. Take a look at your database of customers and identify what characteristics they have in common. As you dig into your database, you’ll find similarities. Do they live in a specific zip code? Do they have a certain income level? Do they all live within a specific radius of the store? How long have they lived in the area? What other stores did they shop? Another way to get this information is by doing a customer survey. A simple 1 or 2 page survey can give you mountains of valuable information about your customers. This information allows you to carefully craft specific messages to a small, highly targeted group of people who resonate with your message. Lets say for example you find that many of your customers have lived in their homes for over 16 years, and they drive Honda or Toyota vehicles. You obviously know that these customers are value buyers. They are stable, probably not extravagant with their incomes. (Otherwise they would be moving up and up to bigger and better homes.) They buy cars that aren’t the cheapest, but they know they will last a long time. They buy quality, looking at things for the long haul. Once you have identified your target, and you know what is important to them… you can craft your message. It is probably obvious to you now how you can use the information you collect from walkers, website visitors, and phone calls to your advantage. And you’d be right… if you just started asking people to give you their private contact information without giving them a good reason…or in marketing terminology an irresistible offer. What can you create for them that is so compelling that they would be crazy not to give you something in return? It doesn’t have to cost you anything in some cases. In other cases it can be a small gift that costs very little. The offer I suggest using is valuable information of some kind. Create a report, a consumer advisory that helps the buyer make an informed decision. The first thing consumers want before making large decision is to be informed. They want information! So give it to them, in the form of a report or advisory. Now lets talk about the process of actually collecting the information. When cold prospects notice your advertising and want further information, many times they’ll call the store before taking the time to drive in. So what are you doing to collect their information and follow up with them. You already know at least two things about these customers. They are looking for a specific piece of furniture. They know who you are and are interested in potentially buying from you. You can see now, how much money you are walking away from if you let them call in, ask a question, talk to a sales person, and you don’t get any contact information. They will buy from someone sometime. Perhaps they won’t right now, but eventually they will buy. So here’s the solution, follow this formula already created for you to get prospects to give you the information you desire. If you can do this, you will plug a HUGE hole in the bottom of your leaky marketing boat. Your staff, specifically those who answer the phone, must be aware that their first priority is sales and lead collection. Not paperwork, not processing, NOTHING else is as important as collecting these leads. The receptionist or secretary must understand that they are just as important as the sales people for the success of your company. This can be a hard pill to swallow and may take some time to turn around, but nonetheless, it is critical. Once you’ve let your staff know that their responsibility is to capture lead information, and they will be held accountable, you can start to check the number of incoming phone calls compared to the number of generated leads. You can also note the percentage of calls to leads being collected. Next, you need to give your staff a script and make sure that they use it. Then follow up daily to measure how many leads they get. Make sure that these leads get entered into the database for warm leads. DO NOT get lazy here. It’s easy to get the information and let it sit on the desk and then get pushed under a pile of paperwork. The same day you get the information it should go into a database electronically... no waiting. There it is. Just like that, you’ve got name , phone number, address, and email. That information can be worth thousands of dollars to you if you follow up and nurture your new customer contact properly. The process for capturing the information in house is much the same. It will become the salesperson's job to do this. Typically the receptionist will not have developed a sufficient relationship with the person to get this information. While the prospect is looking around the store, you’ll have someone approach him or her with a gift of some kind. DO NOT have your salespeople approach and ask “May I help you?” This is DEADLY. We all know what the most common response is to that question. So they approach with a bottle of water, or soda or even a “special offer coupon.” I’m sure that you can come up with many good ideas. Make the approach non-threatening. 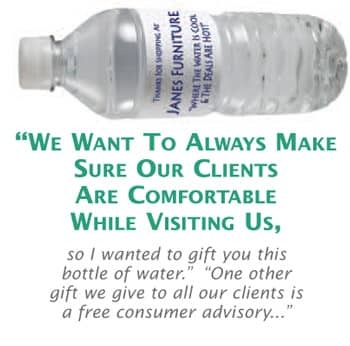 Salesperson Says: “Hey there, we want to always make sure our clients (use the word client or member, never customers) are comfortable while visiting us, so I wanted to gift you this bottle of water. 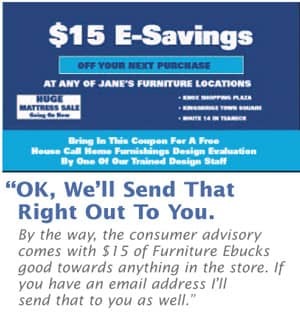 “One other gift we give to all our clients is a free consumer advisory to people shopping for mattresses (fill in what they are shopping for) have really found helpful. It’s called ‘7 secrets you must know before buying your next mattress.’ It includes tips on x,y and z. Customer Says: “Yeah, sure. Do you have one here I can take with me? Be careful with this. 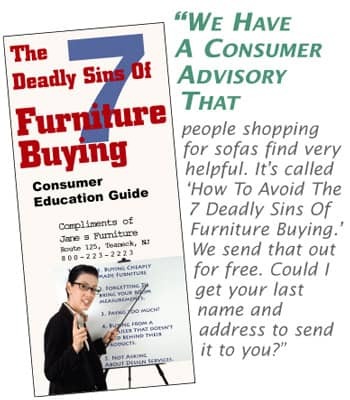 You don’t want to lose a sale by letting them know they can go home and read about buying furniture correctly. You may want to offer them to enter a drawing right as they enter the store. You can give away a Travel Incentive trip, an X Box, or anything else that would create some real interest. This way you capture the information immediately when they enter the store Otherwise, you may want to wait until they are done shopping before offering them a coupon for giving you their email address. This is really simple, yet retailers miss the boat on this time and again, because the internet is intimidating. The key to everything we’ve talked about is GIVING the prospect something of value, in order to GET something of value. The same principle holds true on the internet. Statistics have shown that over 70% of consumers go to the internet before making a buying decision. That number INCREASES every single day. I’m not saying you have to have an expensive site, or have “optimization” or any of that stuff. NOPE, you just need to direct traffic to your site via your marketing and advertising and have a tool to capture that information once they are there. A perfect example of this is our website at www.explodestoretraffic.com. This is a CHEAP site. Cost us hardly anything to build and maintain, yet it is extremely effective at collecting leads. You simply follow the same formula that we’ve talked about. Give away an irresistible offer in return for your customers contact information. Now that you know how to fix your leaking marketing boat, the next step is cultivating a relationship with this warm list of prospects that you have created. This doesn’t happen by sending them postcards every month advertising cheap price, or big sales. You create a relationship by using a direct response newsletter that is informative, entertaining and engaging. Its something they look forward to receiving every month. It’s fun, and exciting. They give it to their friends and relatives… and it becomes the best referral tool you’ve ever seen. I’ll tell you all about how to create one in the next issue of Furniture World Magazine.